This is not really a recipe page, it’s more a ‘Meet Quinoa’ page. I was very skeptical of Quinoa when I first heard about it- it just didn’t look appetizing. But after my first bowl- I was hooked. Quinoa (kEEn-wah) is my go to snack or meal because it fills me up- and I stay full! 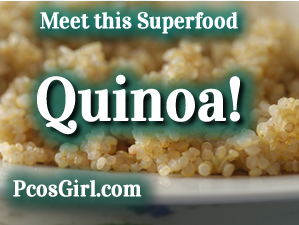 Quinoa is high in iron, protein, and fiber! Quinoa is a good source of: manganese, magnesium, and copper. Quinoa has folate, vitamin B6, and riboflavin. Check out all the Quinoa Nutrition facts Here. Super easy to make! Just boil 2 cups water, once boiling add 1 cup quinoa- cover and reduce heat to simmer for 15-20 minutes. I prefer the white Quinoa, the red and multi taste bitter to me. 1 cup of Quinoa makes approx. 3-4 servings. You can eat Quinoa hot or cold. Cook it and store in fridge for a couple days- grabbing when needed. In a bowl with steak sauce (or buffalo sauce) mixed in. In a bowl with steamed broccoli and BBQ sauce. Mixed with ground turkey and salsa. As a side dish for chicken or fish with dinner. There are tons of recipes online too! If you find any amazing Quinoa recipes let me know!!! This entry was posted in PCOS Friendly Recipes, PCOS Weight Control and tagged recipes.